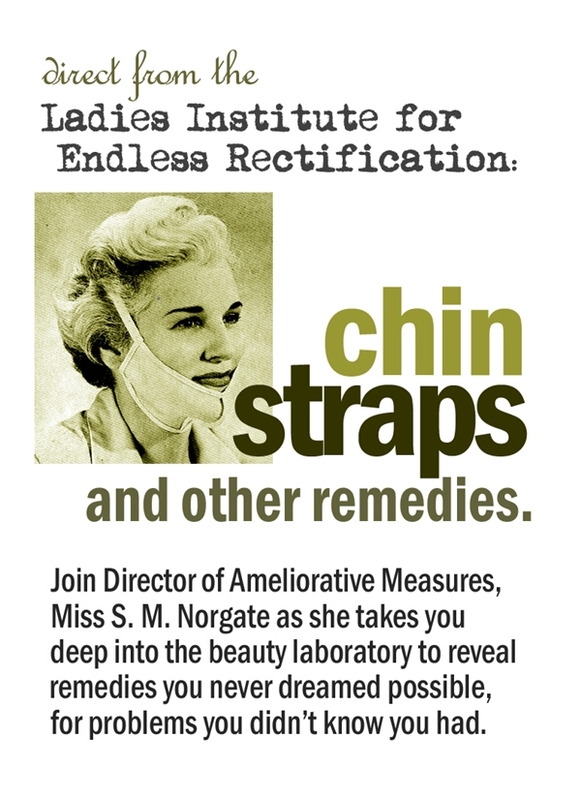 Are you wondering how best to manage the plethora of chins you’ve acquired in the past few years? Are your hands too fat; your legs bowed; your arms podgy and unsightly? Is your nose no longer firm and slender? Do your lips droop? Is your head not well-rounded at the back? These are just some of the female corporeal tribulations that the Ladies Institute for Endless Rectification (LIFER) has been working hard to resolve. Using the very latest pseudo-science, the Institute – devoted to the advancement of women’s self-scrutiny – is proud to present this ground-breaking show. It’s guaranteed to fix what was never broke and maybe even some things that are. If you are a woman in a body, then this show is for you.